FIBA Europe's decision to make all the EuroLeague Women Eighth-Final play-offs games available on their FIBA TV platforms means that at the end of each round a full highlight video from all the games will be made available on their youtube channel. A link to the highlights will be included on this page when the highlights are released. In a FIBA Europe pre-series interview Sue Bird spoke about the beauty of ELW play-offs and their unpredictability. She then backed up her words with a master class performance wit 23 points and 3 steals to lead UMMC Ekaterinburg to victory (61-55) to claim game one against Good Angels Kosice. "We didn't know much about our opponent until recently but we expected it to be a hard game, because the Slovak team has already made it to the EuroLeague play-offs. It turned to be a tough game taking into account that UMMC has a lot of real stars. There were a few moments when we stopped, but every time someone from our players pushed the whole team forward. 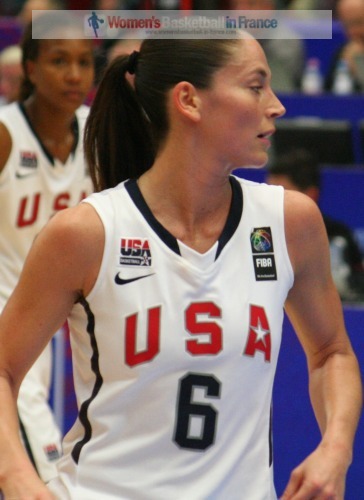 Sue Bird (right) was the one to remedy the whole game. I hope we will be able to learn the Slovak lessons and avoid making mistakes next time." In the other ELW matched played in Russia Sparta&K Moscow Region Vidnoje came out on top against Russian rivals Nadezhda Orenburg (93-79). The match winner was Seimone Augustus who finished with 30 points and 11 rebounds. She did most of her offensive damage in the first 20 minutes with 21 points. Her team-mates Candice Dupree and Becky Hammon added 21 and 10 points each. For Nadezhda Orenburg Rebekkah Brunson was the major scorer with 22 points. Perfumerías Avenida were the only top seed to lose in the opening game of the second round three-match series. They were beaten by Beretta-Famila (59-67). The Italian side led for most of the game with Laura Macchi leading the way with 19 points. Erika De Souza's 23-point and 17-rebound effort was wasted for the hosts who now need to win the remaining two games to qualify for the Final 8. Rivas Ecópolis beat Bourges Basket (65-59) on the back of excellent free-throwing in money-time (7-of-7). Bourges had the chance to win the game leading (52-46) with less than seven minutes to play but decided to hit the self destruct button which allowed Amaya Valdemoro (14 points) to drive her team to victory with the help of 16 points from Asjha Jones. For Bourges Basket Styliani Kaltsidou had a game high 17 points. Ros Casares powered their way to a comfortable victory against CCC Polkowice (88-54). 9 players got on the score sheet with at least 3 points. Ann Wauters (10 rebounds) had the honour of leading the way with 19 points, followed by Maya Moore with 17 while Laia Palau dished out a game high 11 assists. For CCC all the attention was on Polish star Agnieszka Bibrzycka (in picture) in her first EuroLeague Women match of the season. She finished with 9 points while Iva Perovanovic and Sharnee Zoll (7 assists) scored 14 and 10 points apiece. Fenerbahçe SK were not as clinical as in previous games and huffed and puffed their way to victory against Lattes Montpellier (83-71). George Dikeoulakos explained after the match that his team's problems had nothing to do with the absence of Nevriye Yilmaz but the size of the match-up with his guards against the taller Montpellier players. All the same Penny Taylor and Ivana Matovic fired in 24 and 20 points apiece while Angel McCoughtry and Zane Tamane contributed 17 and 15 points. 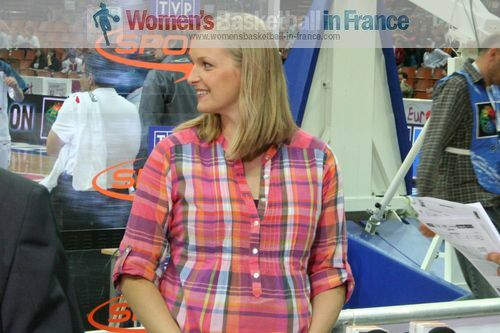 Kristen Mann found her scoring touch for Montpellier with 20 points. Fatimatou Sacko added 13 points while Virginie Brémont, Diandra Tchatchouang and Sandra Dijon all had 8 points each. In the action packed FIBA TV game of the week, Wisla Can-Pack survived a determined effort against ZVVZ USK Prague. The Polish side helped themselves with a balanced scoring: Erin Phillips and Milka Bjelica had 15 points each while Ewelina Kobryn (12 rebounds) and Nicole Powell (10 rebounds) had both 14 points. For USK the absence of DeLisha Milton-Jones and Ilona Burgrová (season over) was clear to see but American international Lindsay Whalen was back to her best with 19 points and 4 assists in defeat.